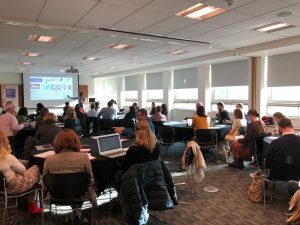 Our first Jisc digital experience insights community of practice took place in Birmingham on the 14 November. 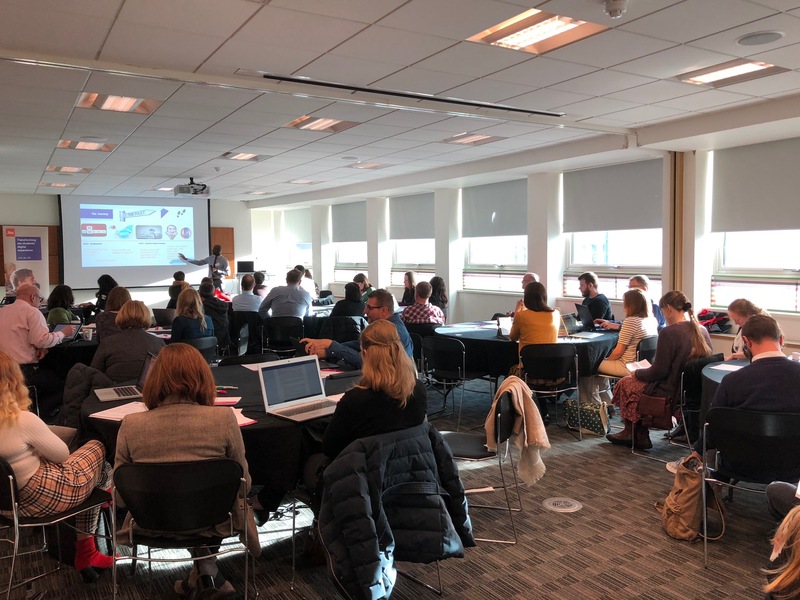 60 people attended from a wide variety of backgrounds, including learning technologists, e-learning managers, librarians, customer relationship managers and academics from both further and higher education. This was my first opportunity to meet people ‘at the front end’, people who are actually engaging with the students and running the insight surveys on the ground, as well as taking the results and acting upon these to help improve the digital experience of students across their institutions. I will be working as the senior analyst for the digital experience insights service at Jisc so apart from carrying out the analysis and presentation of the main sector wide reports I will also be supporting and advising institutions on the whole survey process from beginning to end, to help ensure you are all successful in running your insight surveys. From my perspective it’s easy to get bogged down in the data and forget the bigger picture. In the end the surveys, data and analysis are only a means to an end; to improve the digital experience of your students (and now staff) across your organisation. For that reason, it was really useful to look beyond the data and hear all the inspiring success stories that different speakers shared and also to hear how different organisations have accomplished so much in improving the student digital experience (often with small budgets!) and how the insight surveys enabled institutions to achieve this. There was a wide range of topics and speakers. To kick-off we had Sarah Knight, head of change for student experience introduce the aims of the community of practice and give a brief overview of the service (https://www.slideshare.net/JISC/digital-experience-insights-community). This was followed by the first keynote, presented by Helen Beetham on the main findings from the 2018 pilot of teaching staff in UK further and higher education (https://www.slideshare.net/JISC/findings-from-the-pilot-of-staff-in-uk-higher-education). 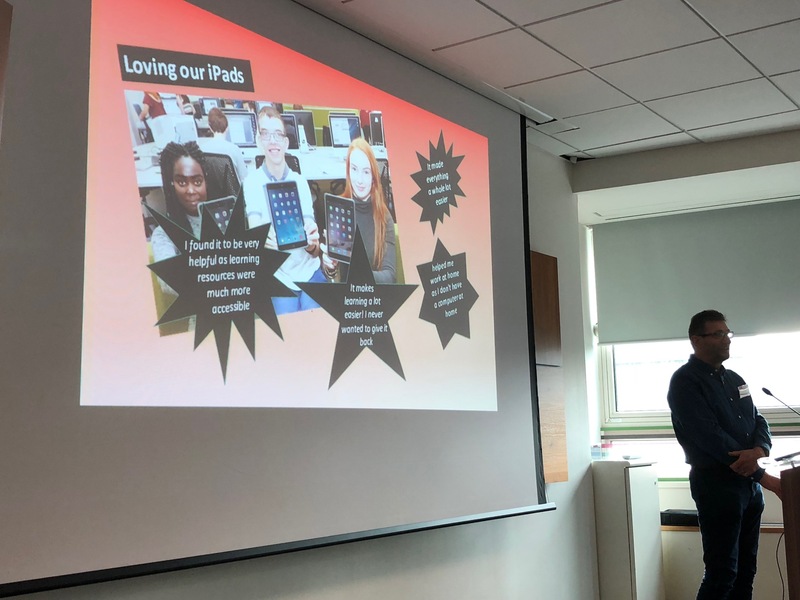 This was the eagerly anticipated official release of the report and provided the first look at how teaching staff engage with and feel about their digital experience and how this compares to the student digital experience. Amongst the many interesting findings, I found it personally interesting that teaching staff are less satisfied than students when to comes to teaching spaces, software and the digital environment overall, but they are more likely than students to want digital technology to be used within teaching. A Periscope recording of the session can be found here (https://www.pscp.tv/w/1nAKEyPAZRnKL?t=23s). We are excited to work with you in 2019 to get a large sample size in order to build on this pilot’s findings. Before lunch we had a series of informative PechaKucha style sessions. 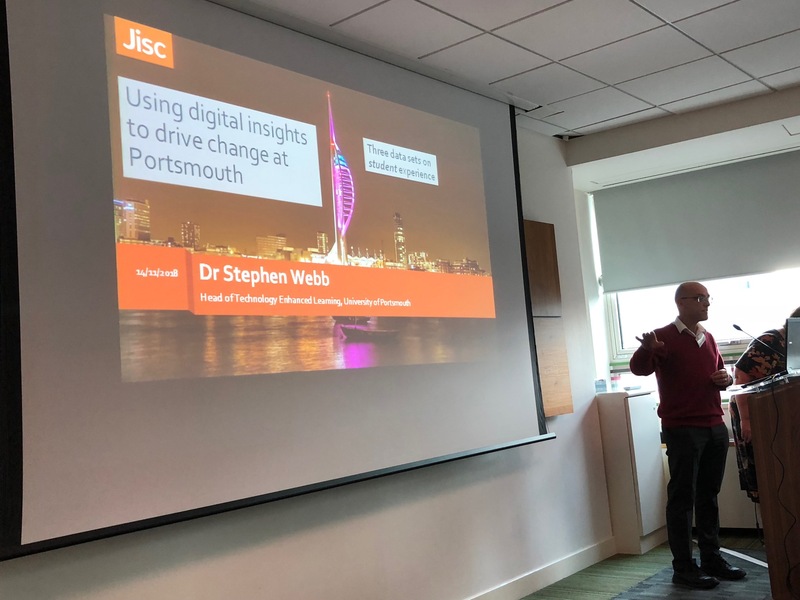 First-up was Dr Stephen Webb of Portsmouth University who outlined how he has used digital insights to drive change at Portsmouth University (https://www.slideshare.net/JISC/using-digital-insights-to-drive-change-at-portsmouth). 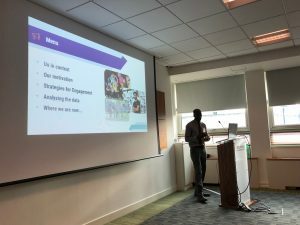 Secondly, we had Dave Monk of Harlow College speak about how digital insights has informed digital developments at his institution (https://www.slideshare.net/JISC/how-digital-insights-has-informed-digital-developments-at-harlow-college). 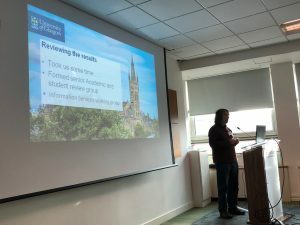 Thirdly, we had Drew McConnell of Glasgow University outline how he has used digital insights to improve the student experience (https://www.slideshare.net/JISC/improving-the-student-experience-using-digital-insights). Firstly, Conrad Taylor of Wolverhampton College described how he has used digital insights to give his students a voice (https://www.slideshare.net/JISC/giving-students-a-voice-city-of-wolverhampton-college). 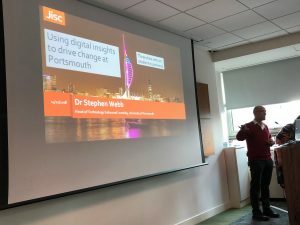 Secondly John Hill of the University of Derby explored how the digital insights has informed and shaped digital developments at the University of Derby ( https://www.slideshare.net/JISC/digital-insights-and-impact-at-university-of-derby). 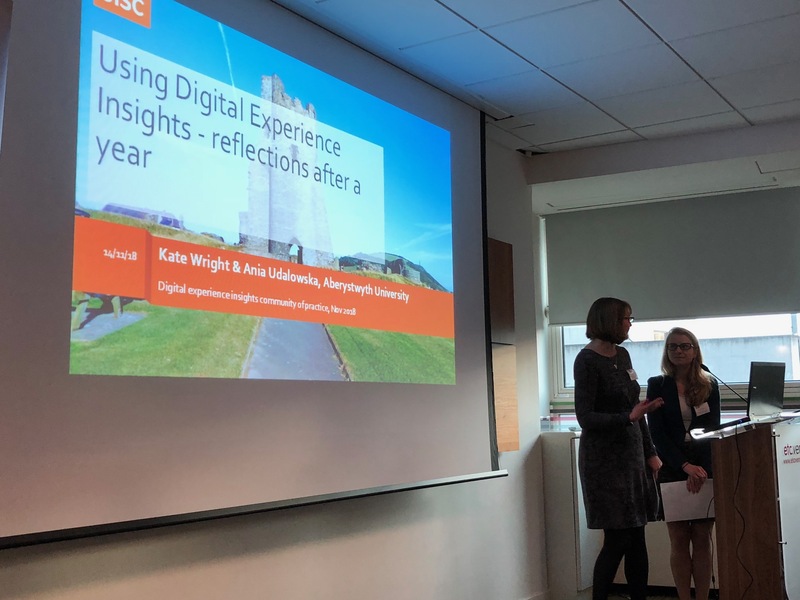 Firstly, Kate Wright and Ania Udalowska of Aberystwyth University spoke about their reflections after a year on using digital insights (https://www.slideshare.net/JISC/reflections-after-using-digital-experience-insights). 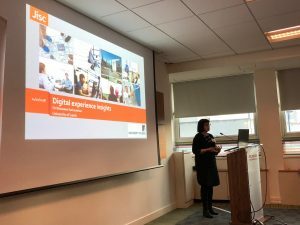 Secondly, Dr Bronwen Swinnerton of the University of Leeds spoke about their experience of digital insights at the University of Leeds (https://www.slideshare.net/JISC/digital-experience-insights-at-university-of-leeds). Thirdly, Cath Fenn of Warwick Medical School talked about the use of iPads in medical education (https://www.slideshare.net/JISC/changing-practice-at-warwick-medical-school). A Periscope recording of the all three afternoon PechaKucha sessions can be found here (https://www.pscp.tv/w/1RDxlqXgbmDKL). As can be seen, a lot was packed into one day and was, for me, a great introduction to the digital insights community of practice! Please remember this is a community led event and we are really keen to work in partnership to run the next one, due to be held in 13 June 2019. 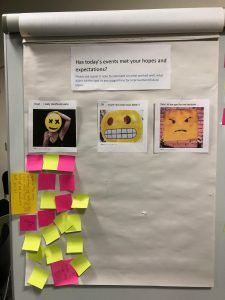 Please get in touch with us if you might be interested in hosting the next event at help@jisc.ac.uk (putting ‘insight surveys’ in the subject line).